Yes really! They are absolutely good for your health… and I’ll tell you why! Be warned… this post is going to get wordy!! I have quite an invested interest in mental health and self esteem, and I was scrolling through my feed on bloglovin the other day and was struck with how wonderful craft blogs are. I usually only read the knitting and clothing-sewing based blogs (because that’s what I’m interested in) and these blogs usually resolve around the ‘look what I made isn’t it awesome!’ Or the ‘ah crap that didn’t go to plan but I’ll show you anyway’ templates. You may have noticed that these are the exact templates that I use for my blog too! And this is the first wonderful thing about the blogging world… we are all like-minded people. We can write about how excited we were to find a shop with like a million different types of buttons, and completely geek out at an exposed zipper put in just right, or just how yummily squishy that ball of wool is… and you know what… we know that no-one will mock us for it, that in fact a reader may be drooling onto their tablet screen at a peacock coloured sock yarn with nothing but envy in their minds. This photo was snaffled from http://www.toxel.com (go and see the full series, it’s very enlightening). I know I’m guilty of doing this too to an extent… just showing the close up of my knitting rather than the full desk with piles of papers and half eaten biscuits. 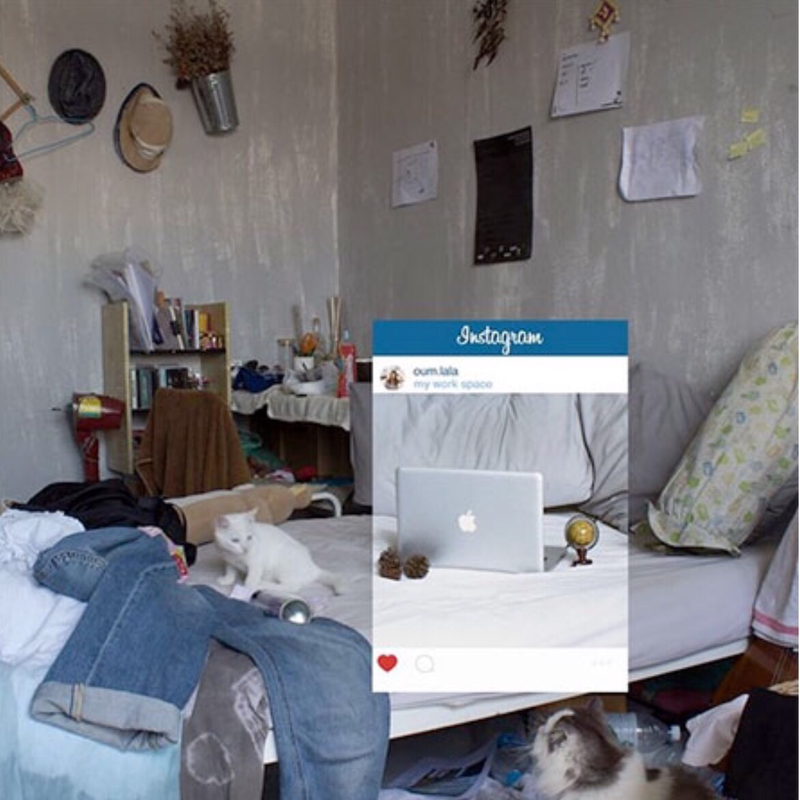 But as I looked through my Instagram feed I thought to myself ‘these people are still real’. Now I don’t mean that in a make believe or fairy tale kind of reality… of course these people are real… I mean that they are all Joe Public. Nothing is staged except a good spot to take a photo. And where blogs are concerned I think there is even less of this ‘wider picture’ exclusion, yeah I avoid showing you the other end of my hallway where there is a messy coat stand and a pile of bags for shopping, but I show you me in all my wide-hipped awkward posed glory! This is the second healthy thing about blogs… or maybe sewing/knitting blogs… ok from now on let’s just assume I’m talking about the crafting blogosphere. 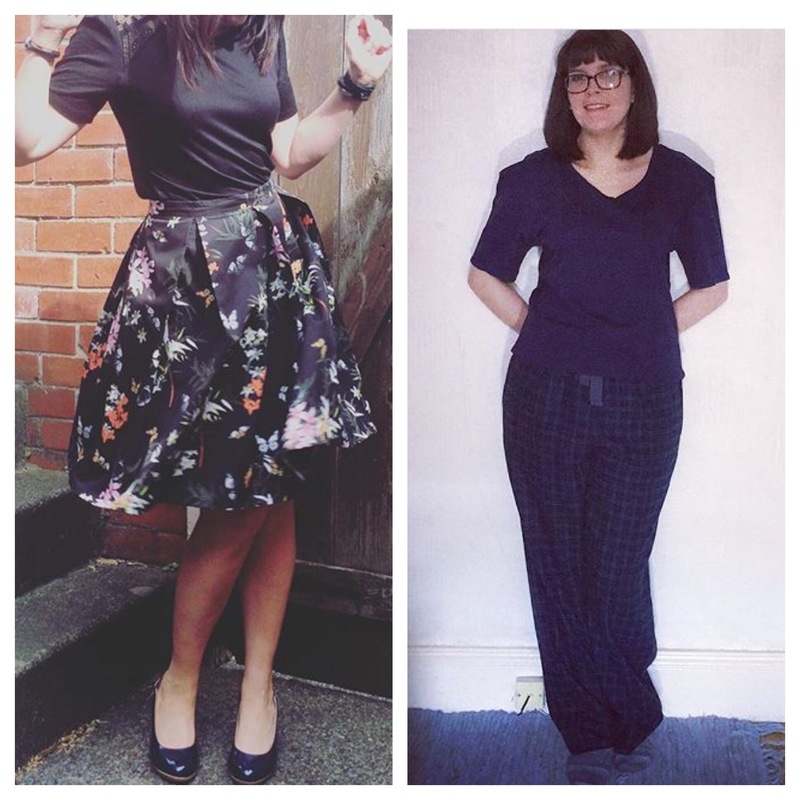 What a blogger shows is themselves… they model the clothes and accessories they have made to fit them! This is one of the reasons we sew/knit, to have clothes that fit us rather than trying to make us fit what whichever high street store churns out. I love seeing real women and real men in whatever shape they come in! And they all look awesome! So surely reading blogs rather than fashion magazines is great for feeling good about yourself… you are repeatedly reminded that whatever shape you come in (FYI I’m third from the right), you look awesome (not all the time, you’ve never seen me just after I’ve got out of bed before my first cup of tea). You are not bombarded by svelte models with impossibly tiny thighs, some of these bloggers may be built like a supermodel, but you know what, some Joe Publics are! You are made to feel ok looking however you look!! Another possible issue I have read about is that some blogs only show the raving successes, making the maker seem impossibly successful at whatever they turn their hands to… this can leave one feeling like crap when they make yet another hideous set of pyjamas which fits like a poorly fitting sack… but there are also people who show the lot, warts and all. Some days I post pictures where I think ‘that looks awesome’ in the hope you can all share my smugness… and sometime the pyjamas from hell get an airing so you can all laugh with me at how badly it can sometimes go. And I know of so many other bloggers who do the same… people who swear at their sewing machines or frog 2 weeks worth of work. This is reason three why blogs are good for your health… they show you that failure is ok! And that once again there are people out there who understand your feels. So what would you rather read? Fashion magazines which leave you feeling that your real life and real body have plenty of room for improvement? Or a blog (or fifty)that show you there are other people who think like you, and who look a million different ways of awesome? Long live the online crafting community!